After my long absence, this could take a while! Firstly, thank you for the good wishes sent to both Heather, Graham and myself which have been much appreciated. As a family we've been, and still are, going through the mill but are trying to carry on as normally as possible through difficult times. I don't want to dwell on bad times here though....just wanted to say thank you for positive wishes and prayers that have been sent. So, onto other things and I have lots of pictures to share, but I think I'll post some of them another time or I'll be here all night! Most of you will know that it was the big Personal Impressions/Ranger event this last week, and, one of the great things about designing for and working with PI is that I get to attend all of these "do's"! I travelled down to Coventry on Tuesday with my friend and colleague, Jan, where we met up with Jayne and Kathy from PI and, of course, Tim, Mario and Alain from Ranger as well as Dyan, Caz and Ben. Here's Dyan, Mario, Leslie (our latest PI demonstrator), Tim and Jan.
.....hate this pic of me, but, of course, Tim is his usual photogenic self! Then, after a quick drink back at the hotel it was time for a reasonably early night ahead of the busy day to come. Lots of people arriving early on Wednesday morning, eager to find a good spot! ....we all had the same kit, but with different colours so that we could swap and share throughout the day. We were all kept really busy making tags with different techniques that we can refer to at any time - we all had numbered labels with instructions of the techniques used to stick to the reverse of each tag. Tim is a natural teacher - keeping the pace steady and quite fast (no time to spend dithering about choosing options!) and injecting humour into the proceedings of course. Sorry about the rather blurry image here! My sister Heather arrived in the afternoon - we had arranged for her to share my room that night and then do the morning workshop next day. Another busy day dawned and this time it was two sessions working on a tag book project with Tim. I was lucky enough to be doing the afternoon session but, in the morning, I was kept busy acting as price finder, personal shopper, photographer, drinks fetcher etc etc! We had a great system whereby anyone could raise their hand and one of us would write down what they wanted and then go and add it to their shopping bag. Here's the morning session underway...you can see Heather right near the front as I got her a good spot!!! ....."personal shopping anyone? 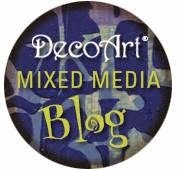 "......I really enjoyed myself running around and taking orders for ink pads, stamps, stains and Idea-ology treasures! After the morning workshop there was time for everyone to do even more shopping! Monica and I were kept very busy checking prices and finding things for everyone. Heather's in the background waiting to say goodbye before catching the train home. Another blurry picture I'm afraid! Here's me with Chris, Heather and Tim - I think everyone was having a good time....Lol! Each session had a raffle prize and here's the lucky winner in the afternoon collecting her bag of goodies. Everyone also received a signed copy of Tim's second book, an apron and a "can't buy these anywhere" bag - all this plus the contents of the kits that each person had used in the workshop. Brilliant! A really wonderful few days in great company, learning more about new products and having a whale of a time altogether! It was a real boost for Heather and myself. Well, now onto the "American Candy" part of my post title! As I was on two workshops, I received two bags and two aprons.....so.....I am giving away a Tim Holtz Idea-ology apron, a photo card of Tim and a signed messenger style bag! Woo hoo! To have a chance to win this great candy, just leave a comment on this particular post between now and September 17th (it's a Tuesday). I will use a number generator to choose a winner on Wednesday 18th September, so be sure to come back and check if you've won - you have no idea how many times people forget to check! If you can add a link from your blog to here that would be even more appreciated. Good luck all! I shall be back to post about other things, including where I'm going to be demonstrating and teaching, very soon, but, meanwhile, don't forget...you have to be in it to win it! Welcome back Lindsay enjoyed the tags look amazing and hosuexpe to see you in Winnington soon. So jealous Lindsay, but so glad you all had a great time !! Hope you can make 21st Sept at AMOM as it will be fab to see you again !! Wow, it looks like you had a really fab time. Nice to see you blogging. Thanks for the chance to win this fab candy. Good to hear you had a fabulous time - must say it looks amazing in any photos I've seen. Looking forward to you coming back to Coventry in the near future. What a wonderful event. Would love to meet Tim, never mind be taught by him. I bet you did some brill samples as usual. Ooh Lindsay I'm so jealous you did these workshops ;-) hope you had fun. Wow! It looks like it was an amazing Workshop! Thanks for sharing the pics and the blog candy! Wow, seems as if you had a wonderful two days full of fun and friendship as well as getting lot of goodies.thanks for the chance to win some goodies and what fab goodies they are. great photos. tim's such a good teacher. can't wait til the next one! debbie.